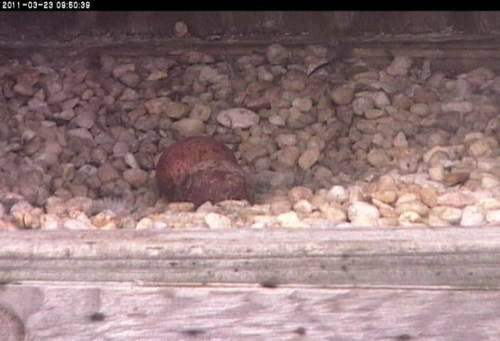 After much watching awaiting, sharp-eyed Falcon Cam viewers spotted the second egg yesterday at approximately 6:50pm. This morning we were able to get close up views that clearly show both eggs. The female spent some time incubating the eggs today, making it unclear how many more eggs we can expect. Peregrine falcons usually begin incubating after they lay the second-to-last (penultimate) egg of a clutch. We’ll expect to see at least one more for this clutch – but is a fourth egg in the offing? Only time will tell.